Sometimes long layovers are inescapable, meaning you could be stuck at the airport for hours. But savvy travelers know that there are fun, inexpensive ways to entertain themselves between flights. 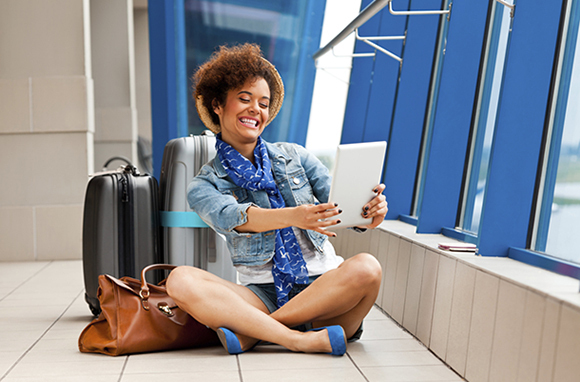 Read on for eight of our favorite activities that are perfect for killing time at the airport. Unless you really like watching an entire CNN news cycle, the airport television lineup can be a bit bleak. Don't subject yourself to hours of infomercials and not-really-breaking news. Instead, sign up for a Netflix streaming-only account, don your headphones, and zone out for a while. At the beginning of each month, Netflix gets an influx of new movies and television shows, plus the service produces its own original programming. (Trust us, we have watched Orange Is the New Black while stuck in Detroit Metro Airport. For eight hours.) You can check your airport's Wi-Fi speeds in Where to Find the Fastest Wi-Fi on the Road. If you're flying international, Netflix may not work, but here is a sneaky way around that. The great thing about meditation is that you can do it from just about anywhere. 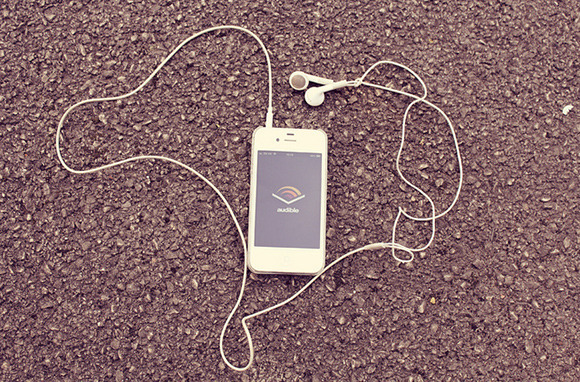 First, download onto your iPod or smartphone whatever music you find most relaxing. Then take the time to do some deep-breathing exercises (we like these 10-minutes-or-less recommendations). Carve out your own personal space, whether it's at an empty gate or a quiet terminal corner. Some airports, like San Francisco, have dedicated yoga studios for flyers who need a moment of zen. At other airports, chapels offer peaceful, out-of-the-way places perfect for meditation and prayer. Experts often extoll the benefits of writing. In fact, a 2005 study in the journal Advances in Psychiatric Treatment found that expressive writing improves mood and well-being while reducing stress levels and blood pressure. So what better place to work on your self-betterment than at the airport? Whether you pack a laptop or tablet or go old-school with a Moleskine and pen, find a comfortable spot or workspace at the airport and simply begin writing. Relive your recent travels, begin your memoirs, or start the crime novel that's been kicking around in your brain for years. You'll be surprised how much time will disappear. 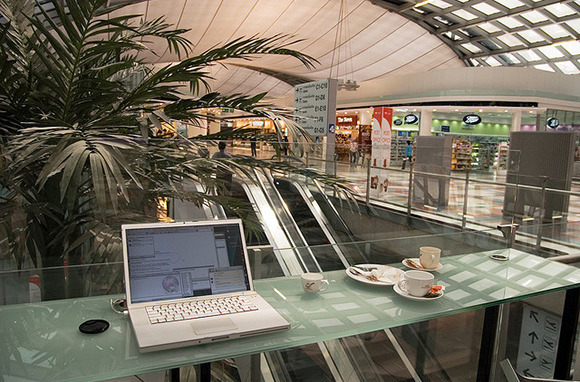 Some first- and business-class lounges have workspaces with desks. Some flyers find it difficult to read at busy, bustling airports. The constant click-clack of rolling bags, the screeching of children, the loudspeaker announcements reminding the Smiths to proceed with the speed of light toward their departure gate—it's enough noise to make reading all but impossible. The solution? Audiobooks. I'm a recent convert to Audible, which has some 150,000 titles to choose from. (New members even get a free trial audiobook, which means skeptical users can give the site a no-strings-attached try.) 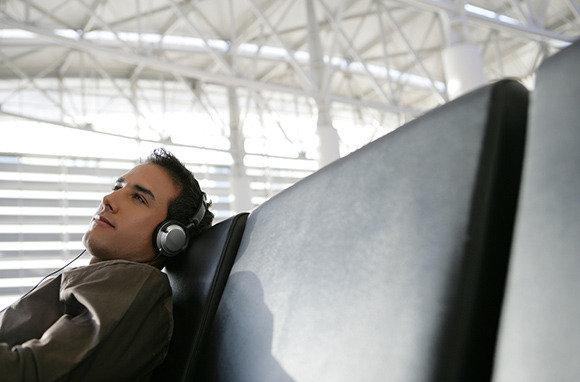 Just remember to download the audiobooks before you get to the airport, as download speeds can be sluggish. Whenever I have a layover that lasts more than a few hours, I allow myself one pampering purchase, even if it's small or cheap. That gives me something to look forward to, even during the endless hours spent waiting for my next flight. Before you get to the airport, look up shops and services in your terminal (or check out our list of cool airport amenities). Then set aside a small amount of time and cash for an in-airport treat, whether it's a new book, an express pedicure, or something as simple as a good glass of wine. While stuck at Newark Airport on a long layover, I watched a preteen complain to her mother, "I have nothing to do!" … while waving around an iPhone and an iPad. As of June, there are an estimated 1.2 million apps available for Apple users and another 1.3 for Android users, so use them. There are apps for every conceivable hobby or interest. Some favorite time-wasters are QuizUp, for testing your knowledge against random players worldwide; 2048, a super-addictive numbers game; Duolingo, fun, free language software; and SketchBook Express, for all your doodling needs. Just remember to bring a phone charger so you don't drain your battery. Sure, you may want to stake a claim on the choice seats closest to the gate, but if you've got untold hours to kill, a long walk is a great way to stretch and stay active. Download an airport map so you know where you are going, or if time allows, simply stroll aimlessly from terminal to terminal. A good brisk walk for 30 minutes can burn 100 or so calories, plus you'll familiarize yourself with an airport through which you'll likely pass again on your travels. Sleep pods and ergonomic work chairs may be flashier, but a good old-fashioned rocking chair is still a favorite spot for harried travelers, and many domestic airports still have them. Grab a relaxing tea at the nearest Starbucks, find a rocking chair with a view of the arriving and departing planes, and kick back. Some experts say that the smooth, gentle rocking motion releases endorphins and can reduce anxiety—perfect to combat the stress of flying.